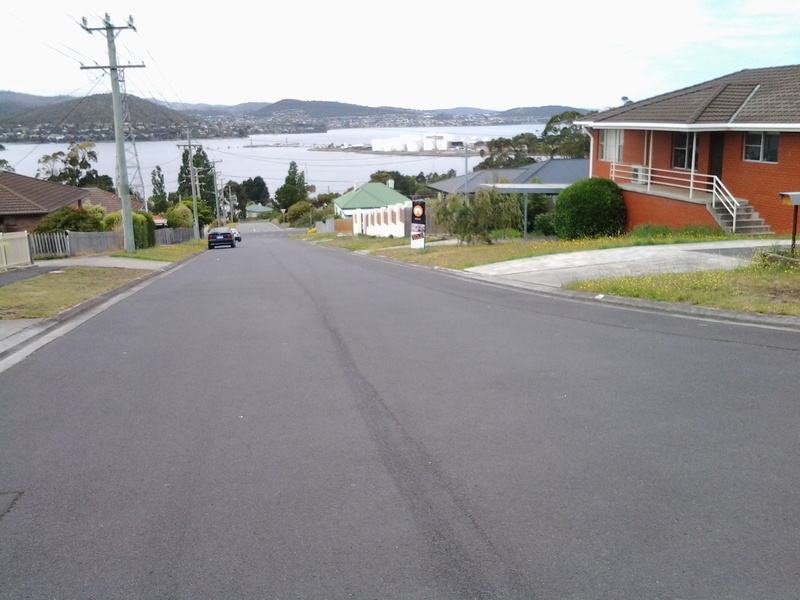 Having made the decision not to visit the industries that hug the edge of the Derwent River during my Stage 10 walk, I turned right and walked down hill along Derwent Park Road on the footpath passing the Veolia recycling plant, turned left at Cox Ave then right at Furneaux Avenue. This route gave me the opportunity to surprise a friend by dropping in unexpectedly. 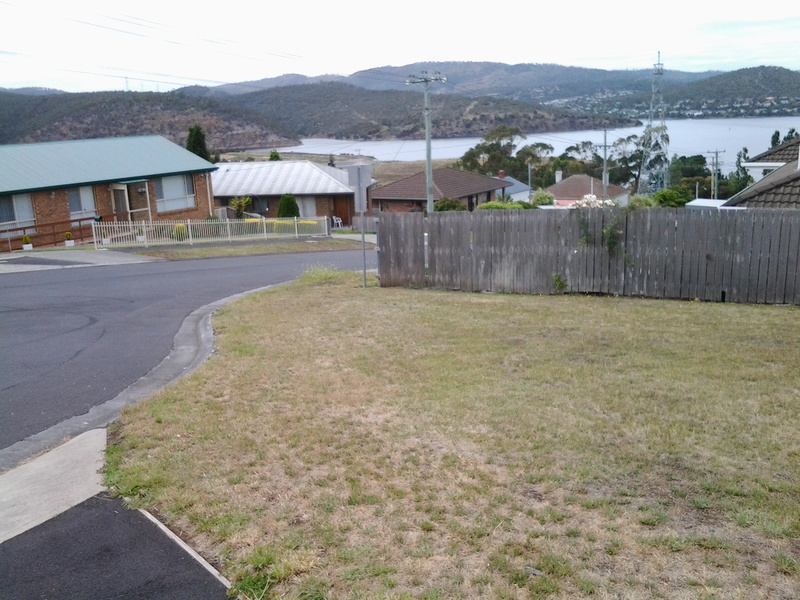 Two hours later after wonderful cups of tea I ventured out again. 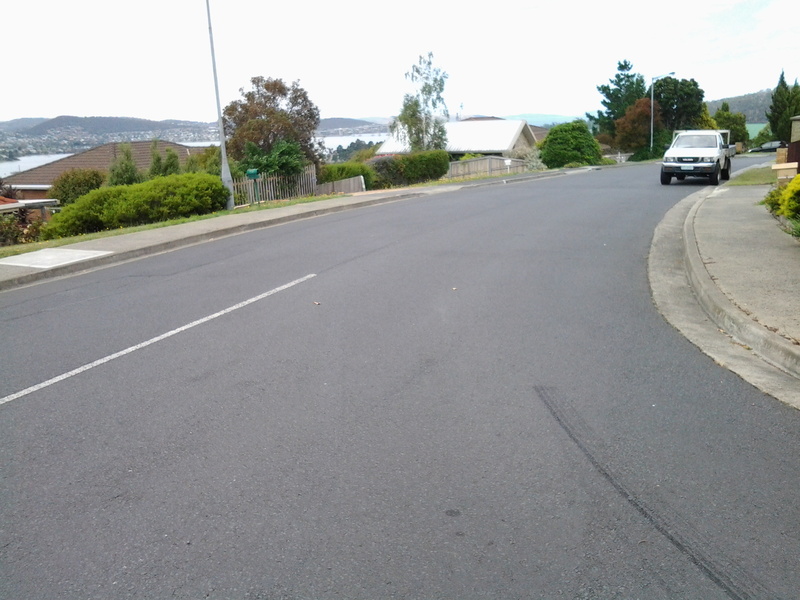 There are many suburban routes over the Lutana hill and I chose to walk up O’Grady Avenue (which made me think of one of Australia’s elite cyclists Stuart O’Grady who was a major player in Le Tour de France and other international races, but has now retired) turned right into Bowen Ave, left into Michael St, left at Lennox, and right at Ledwell St.
To the south and east, the views included Bedlam Walls and East Risdon State Reserve on the other side of the Derwent River. This gave me a perspective I never had when walking on that side of the River in an earlier stage. 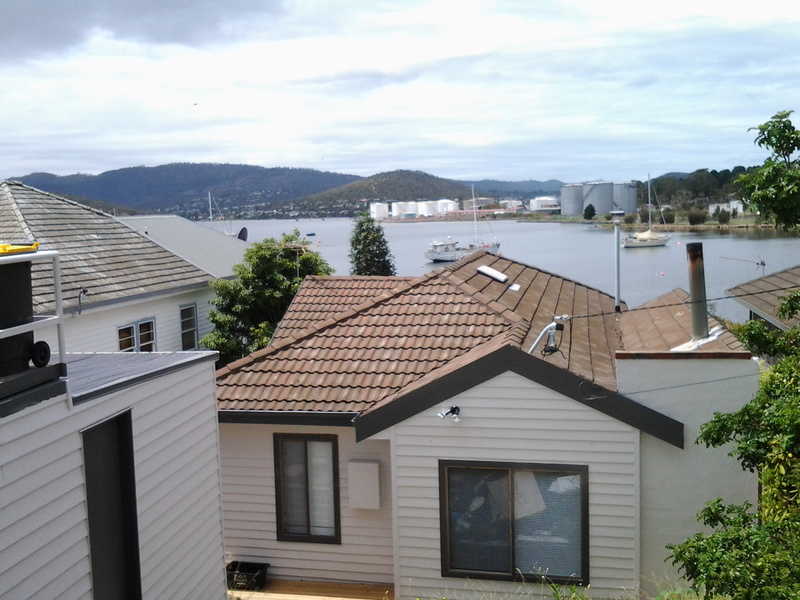 There came a point where I could see the Tasman Bridge in the distance (staggering now to see it was so far away and yet I walked under the Bridge and continued onto Hobart later that day). Landmarks further south include large white fuel tanks. 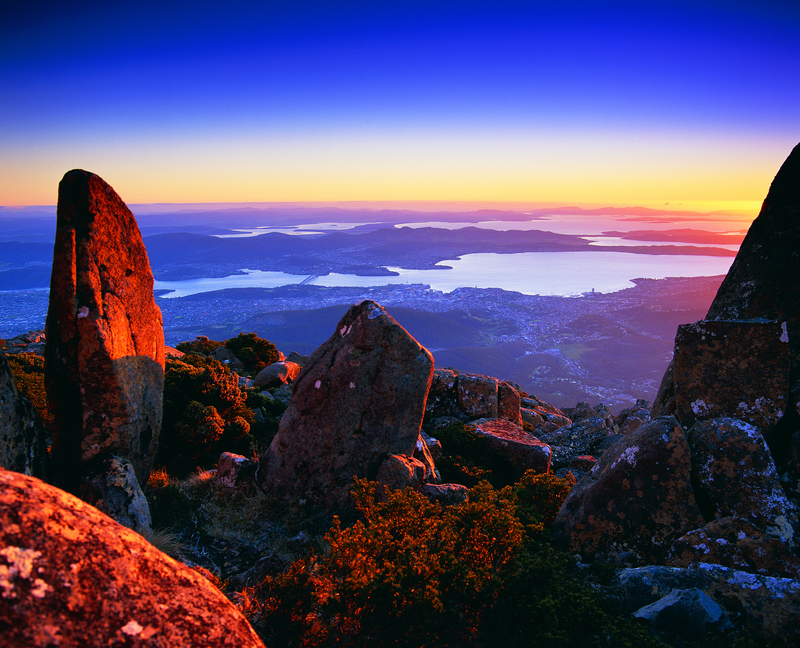 These were clearly visible from a number of vantage points as I walked over Lutana. 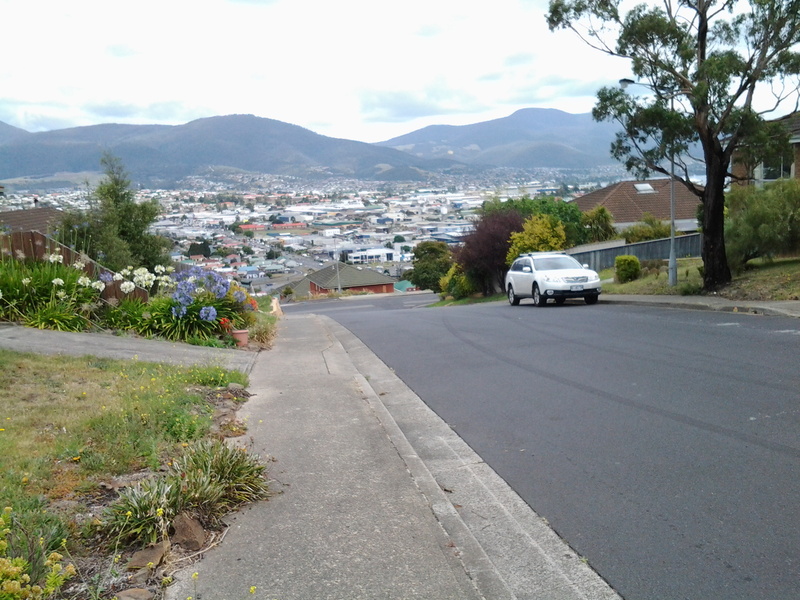 I continued downhill on the southern side, until I crossed Ashbolt Crescent at 12.45pm. 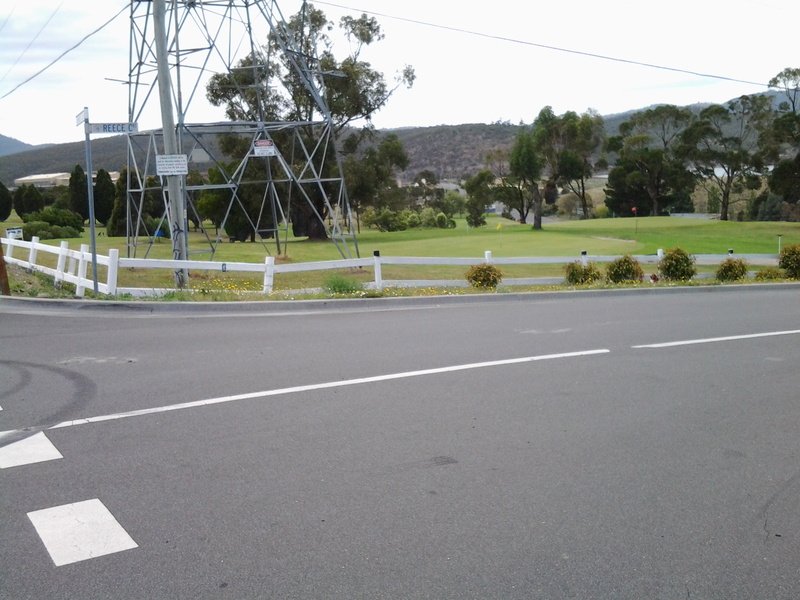 I was surprised to find a golf course designed to flow on either side of Reece St, a normal suburban street that I walked down to reach Risdon Road. 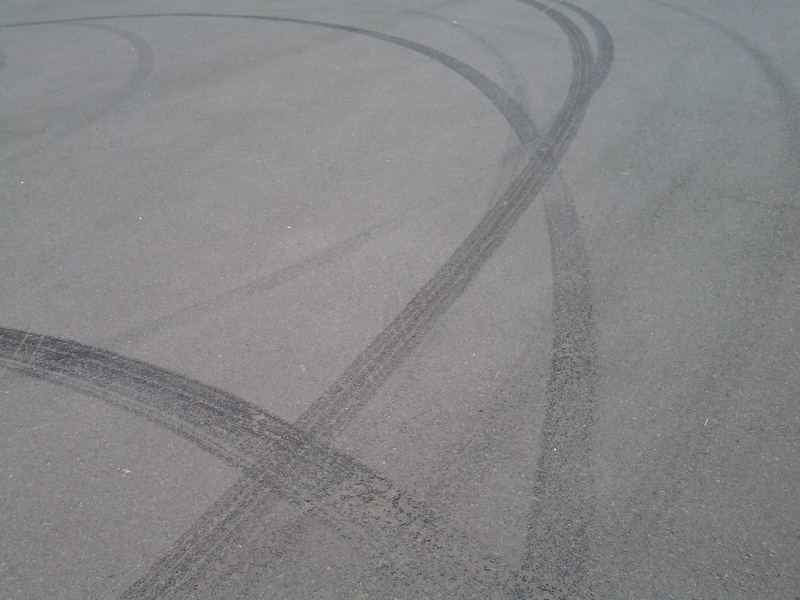 The visual highlight of this part of the walk was the graphic nature of tyre marks on the streets from hoons doing wheelies and other mark making with their vehicles. I liked looking at the result and have made this image my computer screen background for the moment. 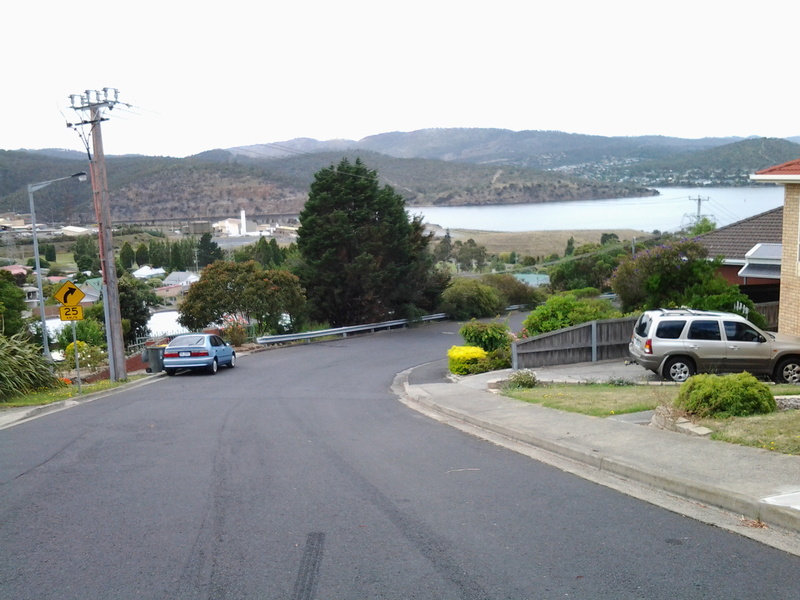 Once down onto Risdon Road I turned right and followed it parallel to New Town Bay in a westerly direction towards New Town Creek. 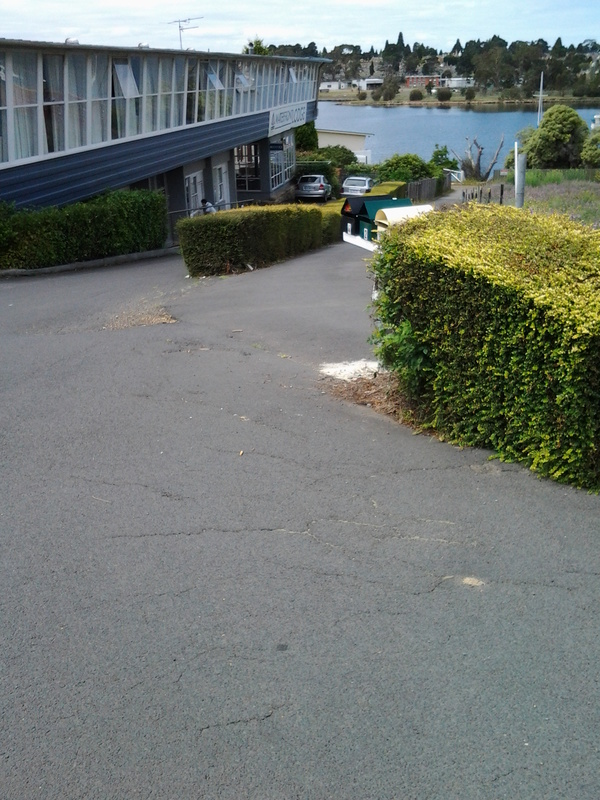 About 1pm I was passing the Waterfront Lodge, motel accommodation which I did not know existed. 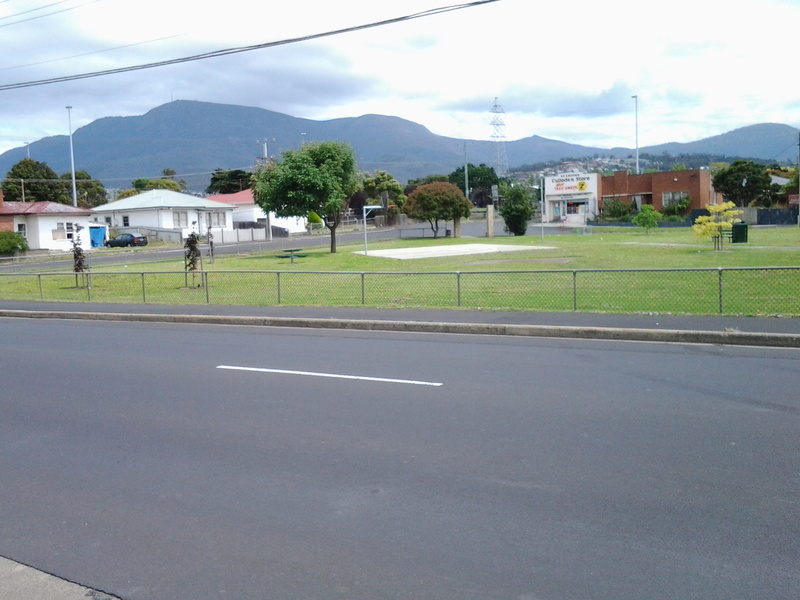 Five minutes later the Apex Park was on my right and on the other side stood the Culloden Hot Take Away Store with the glorious backdrop of Mount Wellington. 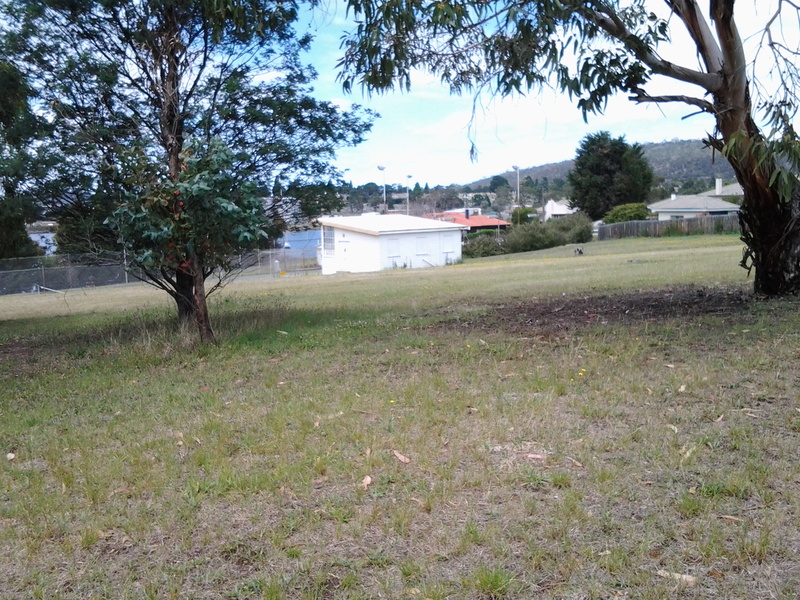 When I stood and looked south, I could see a few tombstones of the huge Cornelian Bay cemetery between the trees on the distant small hill. 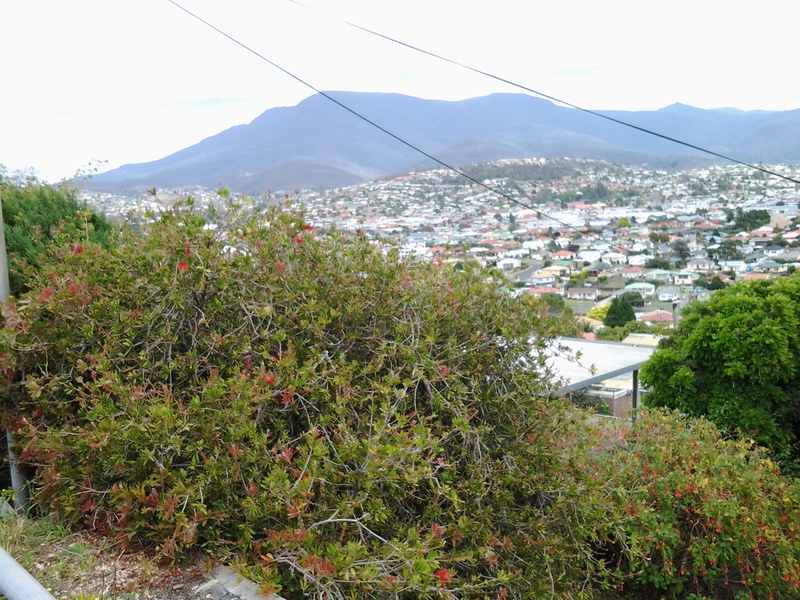 In this photo, a smidgin of New Town Bay appears in the left of the photo through the vegetation. 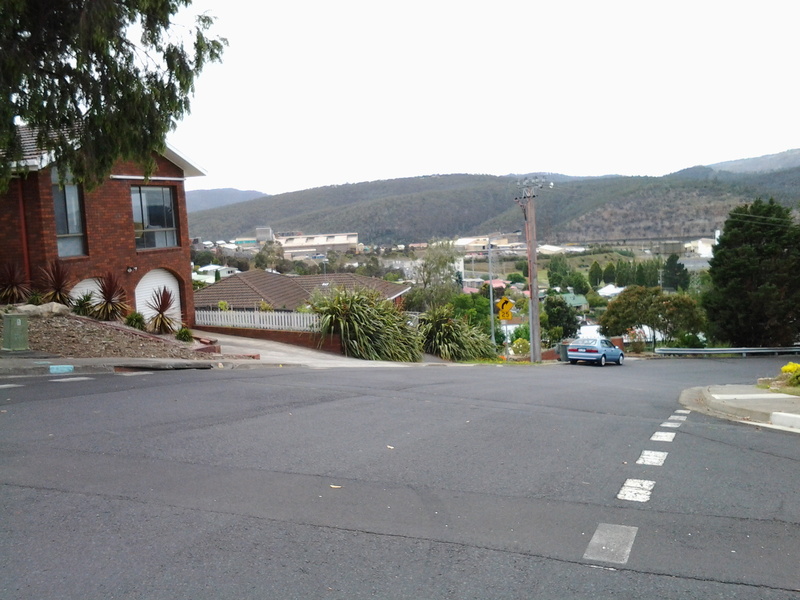 At 1.07 I reached the junction of Risdon Road with the Queens Walk,where a bridge crossed New Town Creek. 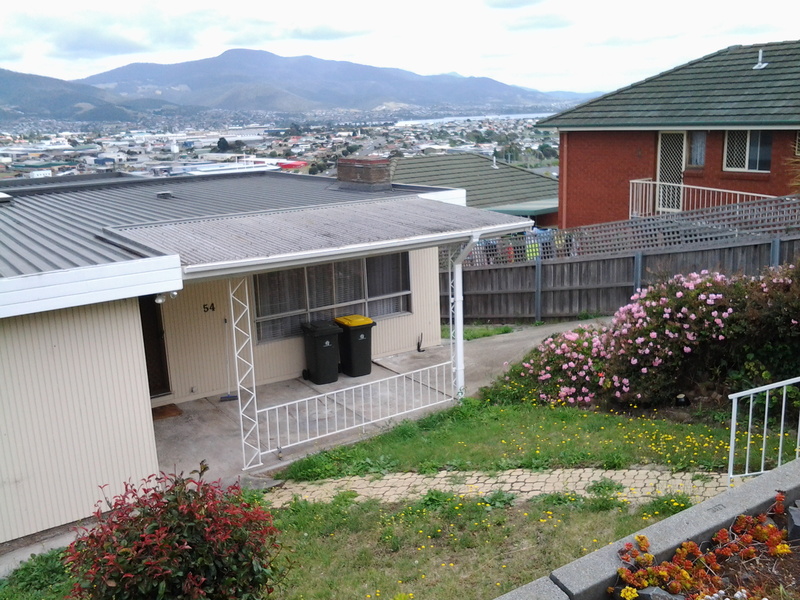 This entry was posted in Derwent River, Hobart, Mount Wellington, Tasmania, Walking and tagged Apex Park, Ashbolt Crescent, Bedlam Walls, Bowen Ave, Cornelian Bay cemetery, Cox Ave, Culloden Hot Take Away Store, Derwent Park Road, East Risdon State Reserve, Furneaux Ave, golf, Ledwell St, Lennox Ave, Lutana, Michael St, Moonah, Mount Welington, New Town Bay, New Town Creek, O'Grady Ave, Queens Walk, Reece St, Risdon Road, Tasman Bridge, Veolia, Waterfront Lodge on January 14, 2015 by Tasmanian traveller.